Richard Canning graduated from the Belfast School of Art, Ulster University, in 2018 with a series of A1 size rectangles carrying line drawings. The current exhibition still flirts with that mute agent of the change, accepting the artist’s intention to make large scale line drawings this time. Drawing is a glorious chapter of humanity’s leaving marks. Not always to describe the ownership of a territory, Canning stresses the difference between in and out. Belonging and not. Canning situates the drawn motif in an empty abstract space evoking simultaneous being and nothingness in the world, in the perception, in any intention. Cut out of the whole, the detail below makes visible the sensibility of the drawn line, stretched or waved or pulsating, as well as its mimetic force, namely in the open door. The gallery handout introduces the thought of “intimacy” made visible through the empty spaces and unfinished lines. I sense an approximation of going down the stairs and through that open door. Its lower vertical edge is equidistant, on a midpoint, between two other points: the lowest loop of the left balustrade and the top end on the right one. With the rest of the wall (glass rectangles ? ), it forges a right-angled triangle. I perceive that as a kind of intimacy between the full and empty, between the mark and its ground. Canning photographed the Student Union building opposite the Queens University in Belfast in the process of abandonment and demolition. One of the exhibits in The Space Between translates this view into a line drawing. Comparing the photography and drawing exposes Cannings process. In addition, the absences and presences in the drawing remove some haptic weight of the material. Instead, the drawn objects insist on forging something entirely different – visual discourse between what is visible. The corner made by a row of many and the separate single invites thoughts on hierarchy and exclusion. The easy chair dominates and prevents the single chair to join the many, like a class barrier may do. The size of the single chair on the right is wrong in relation to its position. So are the last stacked chairs on the left of the easy chair. That perception animates the composition and nudges it to obtain the symbolic meaning of inequality and division of power among people. I can almost “hear” the inflated ego of a person who might have sat in it. This interpretation is validated by the switch in the scale of the identical chairs, the same design, and manufacture, yet, some are different, smaller. Canning’s visual intelligence manages to be fresh and measured at the same time. A good value. He invents representational minimalism rooted in the prestige of technical drawing, of architectural drawings, but slipping away from the expected “correctness”. Actually, the drawing dances away from the correctness in another exhibit. Reminiscent of the freedom of the medieval marginalia, the drawings prefer the subtlety of privacy in visual art – so rarely presented on this scale. The viewer is offered a mute proposition inspired by compositional rules, angles, distances, lines, scale, which Canning made visible. It is a loftier part of the imagination that these drawings activate. Italo Calvino distinguishes between two types of imagination: the one that starts with a word and ends in an image, the other starts at the image and ends in words. (Six Memos…:83) Canning started with a word and a photograph (“Upon hearing of the imminent demise… as stated in the gallery handout paragraph 3) and ended with a drawing not afraid of absences. Henningsen has worked with huge blocks of ice almost for a decade. In Helsinki 2012 he included running water in a bottle – which signals the particular characteristic of molecules that can be liquid, mass and vapour. That’s his scientific interest, that inserts mathematics and physics into his performances. Bbeyond co-operated with NI Science Festival and Ulster Museum in Belfast to present a performance by a resident of a distant Svalbard, the artist Stein Henningsen. Its title was given optical play with the meaning by setting the third syllable ZEN in red colour. A reference to the particular way of life and knowledge, I suspect, it is more a playful pointer and less a solution to all the ills in the world today. In reading the title as two words, citizen +gage, the last two syllables gage open a Pandora box of meanings. The Roget’s Thesaurus lists guarantee, bail, bond, collateral, deposit, earnest guaranty, pawn, security, surety, token, and a warrant. The dictionary entry for gage connects it to the ethics: as a noun, it means a valued object deposited as a guarantee of good faith, as a verb, it is an offer of an object or one’s life as a guarantee of good faith. I settle on the artist as a citizen to pledge a valued object to the audience: water as a condition for life, its trinity present here in man, flower and ice. And as the grey clouds. The fabric of the Earth … is that valued object Henningsen foregrounds in this performance. Biology, physics, mathematics guide the background for the Citizengage first few minutes. Cut fresh red roses are placed in equidistant intervals on the terrace of the museum between two invisible parallels. That is a careful geometry in practice. Although executed at flying speed the pathway marked by roses looks engineered to follow a straight line. The roses will have no time to wilt for the lack of water, the ice block will grind them, one by one, out of life. The second part of this performance, pushing the ice block from one end of the terrace to the stairs is the slowest, consisting of progress and frustration, like the continuous play of plus and minus, move and stop. Physics, geometry, and arithmetic were evoked to produce the optimal weight and shape, but could not predict the duration of the whole and each part/phrase. He had to turn the block from its dry to surface lubricated by a thaw. Changing position to focus the force of the whole body to shift the ice. Pushing with his forehead, his shoulders, his back – and slipping. The polarity of body and ice block prompts different encounters. The meaning depends on each viewer zeroing on some part that is made visible. The crushed roses signify impermanence of something treasured. The success or failure of the man to move the ice block wiggle out of the same fate, by slipping into a trust that the artist takes care not to harm himself. The ice block is then delegated into submission as a silent victim (just a mute object). However, Henningsen gets soaked, tired, exasperated, expelling brief noises born from a strain. The authority of the art does not allow helpers to support him, even if there were any, even if it were a part of the intention. He is condemned, like Sysiphus to be alone. Albert Camus ends his essay with””The struggle itself … is enough to fill a man’s heart. One must imagine Sisyphus happy”. Henningsen evokes a desire for cognitive closure. Moreover, he proposes that humanity must moderate its current intellectual myopia and increase bio-centric awareness. The interconnectedness of environment and Brexit focuses onto the third, split second, part – pushing the ice block down the stairs, crashing it. The crossover, intentional or not, reverberates between the visible and audible, the words about the cliff, crash, no deal… insist on the similarity with crashing a block of ice. This interpretation is not compulsory – only possible, moreover it would fall under the Deleuze’s warning of inadequacy. Given the long chain of Henningsen’s performances using a block of ice, sheets of ice, water etc, the significance of water as a subject is not in dispute. This performance draws attention to the need to recognize the true place of mankind in the universe. Starting with nature, here and now. This performance converged on being-in-the-world, where art and nature are co-dependent. Its meaning may be arbitrary, culture-specific. For me, the meaning of this performance is what E Panofsky somewhere called ” natural meaning of art” as a challenge to habitual thought. Francis Alÿs, Paradox of Praxis I (Sometimes Doing Something Leads to Nothing), 1997. © Francis Alÿs. Courtesy the artist and David Zwirner. Oh, the lure of nothingness! If you think that the installation looks like many other exhibitions in Europe over the last two decades, you may be acutely aware of the spirit of the age, borrowed from the German language as Zeitgeist. Philosophers associated with that idea include Herder and Spencer and Voltaire. It counters the Great Man theory popularized by Thomas Carlyle which sees history as the result of the actions of heroes and geniuses. Earley also explores the chance mobile phone photography harvests while the photographer is mobile, i.e. driving or driven. It may appear obvious for now and here. The implication is that the viewer’s mind drives the aesthetic experience. Let me digress to test that. The question for Earley appears to be the value and power of spontaneity. Of a flow which she arrests. Andrew Glen(b1981) makes the “curious relationship between object, experience and artist” into a locus that facilitates the choice of a found object. Yes, it nods towards the Arte Povera, yet, it has an up-to-date root: Glen’s personal collection he started in 2015. On the far wall the blue-green Bute wool&found objects is a part of the ongoing series ATOMICA. Andrew Glenn is recycling a useful object into a free art by canceling its usability, not miles away from Duchamp a century ago. When a person visits an art exhibition they carry in their mind both “closed” and “open” questions. Installation view: D Magee, G Carson, video Alex Brunt. The closed questions are “a priori” thoughts, likely to be connected to their previous experiences with and memories of art. They refer to similarities and differences. The open ones are those formed by dynamics of curiosity and creativity of the viewer on one hand and the power of the work of art (the artist). It is not a straightforward process – ‘All observation must be for or against a point of view,’ is how Charles Darwin put it in 1861. Hayley Gault included two long paragraphs in the gallery handout to explain how her curatorial practice which focused on environment and landscape was supposed to champion “ the value of exchange and types of transparency”. She printed a stack of sheets listing similarities between her father, a farmer, and herself: an artist, curator, activist, researcher, writer. She named this installation Things me and my father have in common. Its roots are in installation art, in conceptual art, in early modernism minus Dada, in the art and language tradition of the 1950s. It also echoes, perhaps unwillingly, the not so glittering removal of specific talent as the indispensable protector of visibility. (I have in mind those periods when we see the hegemony of ideology). Her exhibit confirms Ondak’s statement that “The Source of Art is in the Life of a People”. That includes the visual artist’s ingenuity in crafting questions, expectations, hypotheses, and theories to make sense of their subject – visibly. This exhibition strips the objects of flattering their makers’ importance. Instead, it matters what is vitally located in each exhibit. Here, it occurs by replacing the very value of use championed by W Morris. Yet, McCambridge entertains a similar aim: to make an object recognized as an aesthetic object by replacing the machine with a hand. Quite! I give up, but do not deny the link to the 1918 manifesto by Tristan Tzara quoted below. positive sign without a cause. But this need itself is obsolete. Gerard Carson may agree with some of Tzara nonsense as nonsense, but in visual terms, he is a dead serious player for tacit communication between optic, haptic, and illusionary. Stretched like elastic, it’s untethered from hermetica, blooming from conjunctions. A speculation on futures via a tenuous materiality that is constantly on the verge of dissipating. (Re)Mixing from the mutating jungle of matter, feeding through a viscous interstitial mesh. I see the chain and I read a sculpture, a rough immobile silent sibling to the chatting mobiles by Alexander Calder. Its prettiness gives way to terrorizing sadness of broken lives, broken by those dark forces, he mentioned. In between the cascading down and never reaching the ground, it seems to stutter J’accuse (thinking of Emile Zola). And then it wiggles out and pretends that nothing matters, whispering: I am a construct. exhibits installation with sculpture and print. It may be thought of as three objects not connected, but the way they are placed is softly considered to signal togetherness. She gives it all one title: “Untitled (Inventory), 2018 (polyester casting resin, concrete, plaster, digital print). Maybe she entertains the thought of a chain, and not just of grouping. After all -she prefers traditional techniques – a kind of a chain, a thread, between now and before. In her statement on the gallery handout she singles out the connections to locations and memory and preference for multiples, both an association with time. The supreme chain. Her trees(or magnified weeds) are like personages – meeting in a meadow … I hesitate to rule out conflict, or an accident. Moving away from the back wall, the visible space is dominated by Damian Magee. It would appear that the drawing selects a perceived rhythm of the volumes as a wave of subjective attention. Magee makes another claim for his drawing: ” This treatment of a fragment …seeks to explore the ways in which time has informed phenomenological shifts in the experience of cultural objects.” As I understand it in relation to Hegel’s Phenomenology of Spirit published in 1807 and based on a precious philosophical intuition: consciousness is not a completed institution, it is constructed, transformed to become other than itself. As if the selected wave is how the sculptural fragments appeared to Magee’s consciousness when he aimed to capture the essence of what he observed. That subjectivity is one of many possible. Iolanda Rocha lets her subjectivity move on and on, claiming equivalence for each state of what she saw, recalled or imagined. Those rich pickings are downsized by the summary title “Schema”. The seven small paintings/prints (cyanotype and gesso on wood (all 2018) do not tell a story that has one beginning and one end. Each stands confidently alone and together as if there were identity between the two states of being. However the absence of nature – beyond signaling the atmosphere – become a significant sign of anthropocentrism and anthropomorphism. Hannah Casey-Brogan aims at the intimacy of seeing, viewing, by altering the expected, normal, when observing a small format image. Her “Untitled” (oil on aluminium, 2018) does not fully escape into abstraction, allowing the red become an arch above a melee of either a very distanced crowd or some insect, or just a multitude of dark traces. Another small-scale object is made with several materials: text, paper, vinyl, glass and frame. Jane Butler ‘s School of Thought #4,2017. Reminiscent of the preoccupations by the Art and Language of 1967 -70 – it seems to be re-visiting the group’s early conceptual concerns as shown in the example below. both those materials descending onto a head of a willing person. Reminiscent of cinema verite it exposes the visceral, the setup, the observed, fragmenting the whole, perhaps in a hope of lessening the chance of absence of any subversion of the intention, by sympathy or its opposite. The exhibition felt like a sanctuary of vanishing ideals. Subdued. Images courtesy Platform, and Simon Mills. In a simple thoughtful display in both rooms, the art of print manifests itself through forty-nine images by as many artists, 24 from Belfast Print workshop, 25 from PRISM Print International. It contains a brief history of both BPW and Prism, and their international network, list of artists, and images with captions. Printmaking’s power to embody free labour artist, inventor of techniques and skill and publisher, secures its attraction to many; a value often described as “democratic” as opposed to elitist “Beaux Arts”. K Marx issued a distinction between a piano pianist as an artist and a maker of pianos as a worker. Printmaking embraces both. While the MFA and Ph.D. degrees in fine art over the last few decades focus on the verbally describable idea as well as on the application of scholarly methods, this exhibition is “twice-born” through its focus on the chosen single image, the visible, and the development of ways to make its multiples. A reminder of the thoughts of F Nietzsche (The Birth of Tragedy, 1872) on “primordial unity” of Apollonian and Dionysian principles he observed in the classical Greek tragedies. In classical Greece, in fourth- and fifth-century Athens, the major artistic prize of the era, for drama, was given under the auspices of Dionysus, a god of wine and ecstasy. a curious proto-patron saint of the arts, given the story of his birth. Hera, Zeus’ wife and the goddess of heaven, tired of her husband’s philandering, convinced Semele, Zeus’s latest conquest to ask Zeus to reveal his true form — lightning — a sight Hera knew would kill her: No mortal can bear a god in full. Semele died. Zeus tucked their unborn son into his thigh, carrying him to term, earning the child the epithet “twice-born”. This exhibition contains both mining of the history of art and inventive responses to here and now. Recently commentators recognized that the rebirth of realism in visual art echoes that “twice-born” story. Modernism argued that realism is a conservative, commercial mode for a visual image. Whereas at present, it contains a thread of radicalism: the demand that we encounter in a work of art the particular depth of another person’s consciousness. Not a belief. I have not read her book – I have no idea what she means precisely by “the very nature of the object”. However, I share her defense of tacit visual thought, the what and how is made visible. The tacit direct link between what I see and how and when it becomes my aesthetic experience. Often it is instant, direct. The deepest significance of the “Graphic Editions” is the autonomy of the visible. The very first exhibit on entering the exhibition sets expectations high. Apology – the image is too small to make the drama of people in evening attire with faces of the skeletons, visible. The freedom to connect across time and space is not only a precious avantgarde idea, but it is also deeply moving admission of similarity of fears and concerns our species have across differences in time and place. The practice of selling artist’s prints in medieval markets on stalls next to vegetables, which Albrecht Duerer encouraged his wife Agnes to do in Nuernberg, just opposite the window of the room with his press, established print as “more democratic” than singular painting. While the public (patrons, art market, galleries, auctioneers) makes a value difference between the aura of originality and aesthetic experience the artists did not, do not. Joseph Beuys even looked for terminology that would distance his printmaking from the commercial one, calling his prints on blocks of wood, or felt, “multiples”. Visual artists today are like magpies, picking up new techniques, processes – mixing them up in unexpected measures. This exhibition offers excellent examples of the virtuosity with single techniques as well as combinations of several. Take the exquisite drypoint by Mikael Kihlman, its details, and the rhythm of light and dark recall the softness of brush or charcoal. Adorable is the craft of balancing the rational observation with feeling through a gradation of light. Market in Cracow, 1994Printed images often served politics, ideology, and news. The story of Agnes, Duerer’s wife, points to their supporting role for the painter and the (hand-printed then) books. Visual artists developed group exhibition ever since Le Figaro (I think Albert Wolf 1876)) compared the First Impressionist exhibition to the disaster on the par with the Paris Opera being damaged by fire. Soon – Europe’s printmakers joined across boundaries (like in Prism) and entered the galleries as equals. Art dealers, auctioneers etc turn visual art into a commodity but tell nothing about the aesthetic value of a work of art. Multiples attempt to shift the value judgment away from the business and close to the viewer’s experience. Making visual art is still free labour – as it was in paleolithic cave paintings and prints. Printmakers often focus on moral issues. Think Honore Daumier. His series renews a call for people to act as good ancestors, while younger generation prefers attacking habitual thought,e.g. the- white- on- white photo etching by Fiona Ni Mhaoillir. When clarity is the same as confusion, and a chance is like an order. The glory of observation and economy of means do not disable poetry of a considered still life by Lisa Murray. Her photo-intaglio is also an enchanting refrain of naturalist’s catalog and Dutch 17th C still lifes – minus pyramidal composition. It is reminiscent of playful Hellenistic mosaic. Whereas a keen photographer brings forth the acuity of vision as beauty. The system is optional. This exhibition trusts togetherness as a creative force, not just across the globe but also across history. In that, it echoes Diane Henshaw’s Drawing Box of few years ago as it traveled all over the world adding artists as it went… And different motives and different styles. The fluency of mastering the technique is a part of the viewer’s aesthetic experience – I suppose Monson got it during the years with Stanley William Hayton who furiously protected the work standards in his Parisian studio. Yes, furiously – on my visit decades ago. Rebecca Jewell prints on real feathers. The image titled Fragmentation I(Blue and Orange) is surprisingly whole, together, in the way First Nations in USA and Canada manage/compose their wearable art. It feels both dead and alive, a trophy and a loss. The technical mastery is not necessarily detracting from the unfathomable aesthetic experience of the image of nature, in this case, the blue sea. It is removed from a precise observation while it effortlessly engages memories of salty and fishy scent and cool of the sea on a hot day. Sensual riches are feather light in relation to the laborious process. Print making is also a friendly helper to verbal art, this time with a portrait of the writer/filmmaker, rather than an illustration of the poem by Coleridge. The black gnarled tree reminds me of Altdorfer and Danube School of the landscape, their departure from Middle Ages. This image of an abandoned man-made construction in a powerful landscape is similar to the late medieval statement about the death of something man-made. Here that verse resonates for me again. Consequently, a dose of constructivism in jolly light colours offers a balancing act. With a smile. Masahiro Kawara’s sensitive observation and steady hand mastering the chosen tool and technique cherish the unimportant, neglected, yet significant sign of privacy, whereas it allows that powerful edifice on the left to evaporate. It feels that both entrances are out of use. The elegant drawing carries a message about us that is not at all elegant. Adapt Bachelard to visual art and you get: the particular depth of another person’s consciousness. On Kawara Masahiro’s Facebook page there are several dozens of images from the vernissage at Oriel Gallery. It is a rich picking. 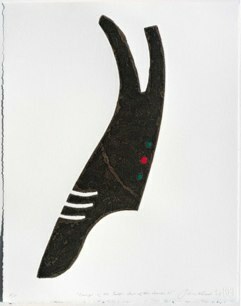 Anushiya Sundaralingam: Entwine, Drypoint, Collograpah; Jim Monson: Harlequin, Woodcut; Ritsuko Ozeki:Landscape and pond, Etching, Aquatint; Vladimiro Elvieri:Frammenti IV, Engraving on Forex; John Read: Songs of the Earth, Intaglia; Toshihiko Ikeda: The Old man Q – comfortable polka dots,Etching. The images courtesy Belfast Print Workshop, except where stated otherwise. Ten paintings in the ground floor and eight in the first-floor gallery range in dates from 1998 (CACTUS) to 2018. It is not a considered a survey, nor is it a disposable indulgence. At some point, each painting gets impenetrable and poignant without becoming bathetic. The images faithfully present this painter’s idiosyncratic mix of representation and abstraction, whether in the mixed media on paper or oil on canvas. There is a marked similarity of style, palette, and marks among the exhibits. Each detail stands on its own – as notes do in music, similarly progressing, not into melody, but into a resonant call for a close attention. That endeavor reminds me of another painter, Armen Eloyan, who flipped recently that a good painting is like a good joke, the pieces have to come together. Crone’s paintings insist that the search for truth or beauty are siblings, at times in competition, at times in harmonious sharing. The paintings reveal a dystopian world. Brusquely shattering already dissolving forms are thrown out of balance, the paintings confront the viewer with existential questions, the conditions in which the painter lived and worked. The Troubles, the divided people, the absence of and hope for -togetherness. These paintings call for a closer attention to how it is rather than what it is. Not the look, but rather the energy of life under the oppressive forces when people are unable to move away from habitual thinking. The Ballymacarn series, I -IV (2014, mixed media on paper, 38×28 cm) illustrates what others recognized as dominant characteristics of Crone’s art: namely ” a slow accumulation ” ( Aidan Dunne on https://www.irishtimes.com/culture/art-and-design/visual-art/david-crone-and-the-art-of-slow-accumulation-1.2880880). A slow accumulation may be applied to a viewer’s experience too. At first -the impact of the multitude of different marks evokes something near the primeval beginning, chaos. Only when the eye discerns the light as its ally – the fragmented landscape becomes one – albeit more mysterious than descriptive. It is rather, a kind of existential uncertainty so well understood by F Kafka, even if Crone reads more often the delightfully daring fantasies of Italo Calvino. Akin a twist in a Calvino’s story, at times one hue carry the uncertainty. For ex. he includes a high light of a yellow which partnering with real light saturates into an illusion of gold. In a small oil called Objects (2009, oil on canvas 35x25cm) that task is taken care of by a green hue. The paintings are both abstract and representational, a duality akin the lived uncertainty in a society. Wilhelm Worringer in his Abstraction and Empathy(1908) classified two stylistic polar opposite views as abstraction and empathy. He proposed that when we are comfortable in the world —e.g. in ancient Greece and Rome and during the Renaissance—we tend to want to empathize with the world: to idealize it, to make objects that objectify our delight. And when we feel uncomfortable, uncertain, and anxious in the world—e.g. in ancient Egypt, during the European Middle Ages, or during the Modernist era—we tend to create abstraction, artworks that suppress the look and space of our surroundings. In recent paintings, e.g. Field Objects (2018, oil on canvas, 115×92 cm) Crone moved the whole palette towards greens and blues, hues observed in nature around him. The subject’s outlines dissolve in a quest for a different way of being. A sort of osmosis with nature, embodied awareness, one that is open to whatever makes itself present before us. In an age of fast-paced technologies and instant hits, the unadorned act of standing in the field, experiencing its sounds and smells may have a reviving power. On the day of his death (1931-2018), I recall that Robert Morris’s writings and art is thinking about the nature of perception. As Michael Fried observed, Morris includes the viewer/observer. 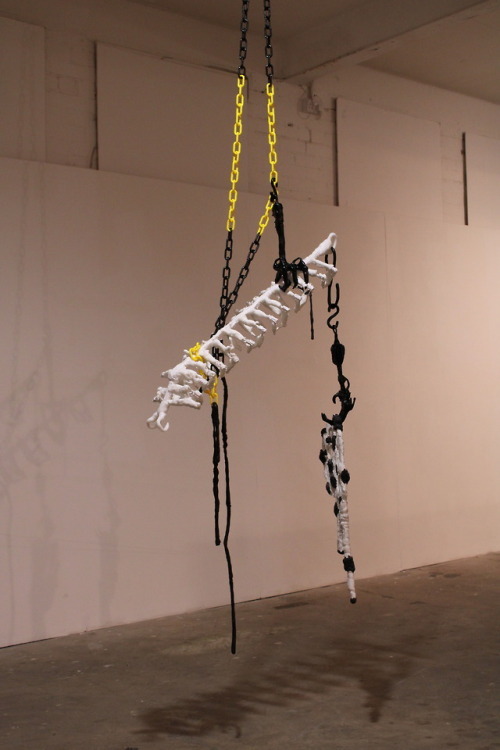 Both sculptural installations at Platform, in a different way, do that too. Drydan Wilson wrote in the gallery handout that he was interested in “play”, in “extreme forms of play” – something akin his experience with “skateboarding”. On the other hand, he claims an interest in the influences of social structures like barriers, systems, regulations. Role of paper, scissors and black line drawn in the middle. The visitor is invited to cut a piece of the line to take away. It is more than experiencing an aspect and less than a free play. Rather, it is a polite seduction to obey the artist’s intention. The experience is narrowed down to, in my case to hesitancy and curiosity, before cutting a small piece of the line clumsily, and somehow liberating the scissors from the string. I made a new safety knot to keep it hanging where it should. I did not experience it as a play, only as a response, a participatory act. Dry and mysterious. Without an answer to a why question. The performative elements appear in the stasis of the wooden constructions too. They do not obey any predictable tectonics. I marvelled at the rhythmical cuts in the arched wood – it appeared poetic, in gently evoking touch and smell experienced when working with wood. In this image, what looks like short lines, are cuts, each has a depth, just enough to make their depths secret. The black cube is constructed in the way one would draw a Necker cube- however, the material frustrates the illusion, the shift from one reading to the other. The sculptures support Wilson’s claim that his work is often site-specific. I sense a visualized struggle in this particular place – as if the wooden arch was condemned to be tethered to the white column that supports the roof. Gerard Carson wholeheartedly zooms on strange mutations of materials “…feeding the anthropocentric desire of infinite accumulation”. The four exhibits shared a summary title of “Submersible Extractions”, given first to the video. It tells about the concerns any good ancestor shares, standing up against the ” feeding the anthropocentric desire of infinite accumulation”. Yet – waiting for alternatives makes us all responsible as we rely on inherited infrastructures,e.g. electricity from fossil fuels. In that sense, Carson makes subtle political art that includes hints on current research in the depth of the ocean and growing awareness of polluted air. A part of the story is given in the twin channel digital video &animation, 2018. On one remote, I thought of it as a soft warning against unbridled exploitation of the environment, specifically that deep in the Earth crust. A similar theme of unease with humanity exploiting resources is evoked in the print “Glyphic Spectre”, AO injekt print, 2018.” The visualised shape disintegrated into spikes and voids. In the photograph on the right above a blue light touched the paper and the top of the column. It also casts a blue shadow, all of which adds up to the “lived” visual experience. As I move, the reflection of the light intensifies and fades- as if breathing in the rhythm of my moves. Somewhat by chance, somewhat by intention, the blue light of the video is pretending to escape into space and engage in a visual “dance” with the “Petronic 1” (wood, concrete, wire, silicone, 3D print, 2017). It looks onto the fourth member of the quartet “Aqua Armature” (wood, epoxy resin, fluorescent light, tape, aluminium, silicone, spray paint, 2018). It appears to me as an elegant duette of metal and its shadow, as a fugue. It is a mute visual poetics. The exhibits appear to fight against their fate (related to the environmental issues) by a collective dependence/ intoxication by light – an ancient symbol of truth. Both artists evoke the viewer’s sensitivity not so much to a story, as to that proverbial mute poetry. And, from my point of view, that is a success of the visual thought, that visibility, which Italo Calvino requested to be preserved for this century. Images courtesy Simon Mills and Platform.